Fourth time was the charm for Initiative 1240, the charter schools measure approved by voters in November. 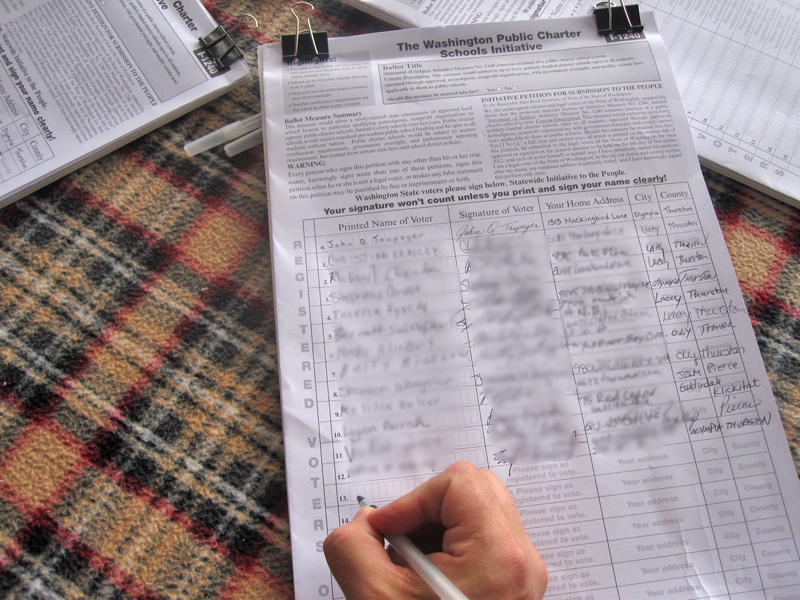 The proposal first appeared on the Washington ballot, in different form, in 1996. OLYMPIA, March 8.—Some charter school advocates aren’t ready to say they smell a rat. But when state decision-makers this week announced their picks for a commission that will oversee Washington’s new charter-school system, noses started to twitch. Kevin Jacka of the Springdale-based Mary Walker School District was among the 80 school superintendents who lent their names to the campaign against Initiative 1240 last year. The measure was approved 51-49 by Washington voters after nearly 20 years of institutional opposition from established K-12 interests. Ordinarily the pick might seem odd, at most a mild political statement — but in an unusual provision aimed at short-circuiting political fun and games, the initiative stipulates that all commissioners need to be believers. Also that they ought to be able to prove it. The battle isn’t over yet, of course. Last week the state’s powerful teachers’ union, the 83,000-member Washington Education Association, filed a lawsuit to overturn the initiative. There’s plenty of suspicion to go around. Under I-1240, as many as 40 charter schools will open their doors over five years, most likely starting in the 2014-15 school year. The publicly funded schools, now permitted in 41 other states, operate outside state rules for curriculum and management. Although opponents say charters represent a drain on existing schools in a state where funding follows the student, it also ought to be noted that they are not subject to existing union collective bargaining agreements which restrict school district hiring and firing decisions. That helps explain the strong opposition of WEA, and why it took four ballot measures and a multi-million-dollar campaign financed by Bill Gates and other tech moguls to finally put it over. Says Finne, “If there are some stealth candidates on here who are going to dance to the tune of the superintendents in this state, it will become an effective way to block conversion charters,” she said. Kevin Jacka, superintendent of the Mary Walker School District in Springdale. Jacka has led a 10-district consortium dedicated to educational reform and has served as the lead superintendent in the Rural Alliance, an organization that promotes college transition and career readiness programs. Lt. Gov. 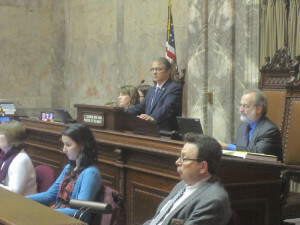 Brad Owen presides over Thursday’s session in the state Senate. Appointments were announced Wednesday, the final day permitted by the initiative. Owen had three picks, as did Gov. Jay Inslee and House Speaker Frank Chopp, D-Seattle. It appears Jacka isn’t the only one who has undergone a conversion of sorts. Former Seattle School Board President Steve Sundquist, unseated in the 2011 election, filled out a questionnaire for the local Democratic party during that campaign in which he stated that he opposed charter schools. On the other hand, the Inslee appointee does have some bona fides that appear to meet the criteria: Last year he was among those who endorsed the initiative. Which leads Seattle’s Melissa Westbrook, perhaps the state’s second-most prolific blogger on the subject — on the opposition side — to urge readers to “tell Inslee that Sundquist was a mistake for the charter commission.” Sundquist ought to explain his change in position, she says. Washington State Wire took it a step further, and actually gave him the chance to do it. Doreen Cato of Ocean Shores, executive director and chief professional officer of the United Way of Grays Harbor and former executive director of First Place, a kindergarten-through-sicth grade nonprofit school for at-risk children and their families. Chris Martin of Spokane, executive director of Prodigy Northwest, an organization that developes leadership and academic programs for gifted youth. Martin also serves on the Spokane School District’s STEM (science, technology, engineering and math) Design and Leadership Team. Cindi Williams of Bellevue, an executive with an education policy firm who has held senior-level policy and communications positions in education, including postings with the Bill and Melinda Gates Foundation, the U.S. Department of Education and the White House. Trish Millines Dziko of Vashon, founder and CEO of the Technology Access Foundation, a non-profit organization that engages minority students in STEM programs through the Federal Way School District. Margrit McGuire of Seattle, director of teacher education at Seattle University and a specialist in curriculum development and social studies education. Dave Quall of Mount Vernon, a former Democratic state representative who served as chairman of the House Education Committee, and a retired schoolteacher who spent 38 years in the trade.